CHARLIE ROSE, PBS HOST: Welcome to the program. Tonight a conversation with Mikhail Khodorkovsky. MIKHAIL KHODORKOVSKY, OPEN RUSSIA: My opinion is that Putin has already worked out that model that he would like to use with Donald Trump. worked it out on Berlusconi. He’s going to look for some kind of personal understanding, personal relations along the lines of like here we are, you and I, way up on top altogether just the two of us and everybody else is somewhere there below us. I’m not sure whether the American political system could handle this kind of style of relations. CHARLIE ROSE: Mikhail Khodorkovsky for the hour, next. CHARLIE ROSE: Mikhail Khodorkovsky is here. He was once Russia’s richest man, head of Yukos’s oil company. He was also the country’s most famous political prisoner until President Putin unexpectedly pardoned him in December of 2013. By then he has served ten years in prison. He now lives in exile in London, and leads his foundation called Open Russia. The organization is laying ground work for democratic governance and human rights in Russia. Journalist, Masha Gessen, writes in Vanity Fair that Khodorkovsky is the most influential Russian to ask critical questions about a post-Putin Russia. I am pleased to do have him back on this program. Welcome. CHARLIE ROSE: What brings you to New York? MIKHAIL KHODORKOVSKY: I have my son’s family living here. I have two granddaughters, so I came to visit them. We’ll spend Thanksgiving together. CHARLIE ROSE: Very well. Happy Thanksgiving. Tell me what you have been doing since you were on this program last time. 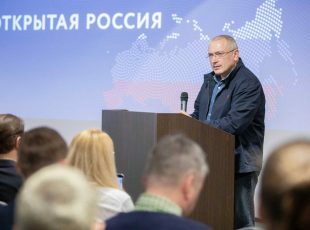 MIKHAIL KHODORKOVSKY: Well, as I have planned to do, I have launched the work of the Open Russia Foundation, which just recently we turned into a movement in Helsinki, a socio-political movement. Within the framework of this movement we are informing Russian society about what the Kremlin would not like to inform the Russian society. We engage in helping young Russian politicians to participate in the elections to the state duma and will continue to help them to get elected into regional parliament or at least participate in the pre-election show that is called elections in Russia. We’re also working in a number of other directions. I think that our activity in Russia is noticeable. CHARLIE ROSE: In what way? Because you’re having an impact on the ground in getting people who agree with you elected? MIKHAIL KHODORKOVSKY: Well, to been elected in Russia today without the present administration’s approval is impossible. The president’s administration very obviously is not going to give us such approval. 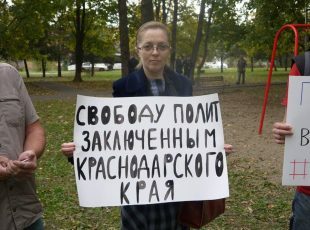 But we can help and we do help young politicians at least present themselves to society, introduce themselves to present an alternative Russian society. You see what the main problem in Russia is that people, they don’t really want Putin to be president forever, but he has cleaned out the political field so much that society doesn’t see an alternative. And ever body is afraid. What will happen when Putin goes? So the task that we have set ourselves is to show society that there is an alternative to Putin, and that there’s nothing horrible will happen when he goes. On the contrary, it will give the country a new and positive impulse. CHARLIE ROSE: That’s an interesting way of putting it. You’re building for a post-Putin time. Does that mean that you believe Putin can be president of Russia as long as he wants to? CHARLIE ROSE: Would you like to be president of Russia? MIKHAIL KHODORKOVSKY: Now that’s a question that I can tell you, absolutely, no question about it, no. MIKHAIL KHODORKOVSKY: The post of Russian president, especially in the crisis in which the current regime is going to leave Russia is not the sweetest spot in the world to be in. And I would be happy if some young politician would be found who could really want to take this post. At any rate, we’re helping such politicians to show themselves. I see my task somewhat differently. I see that at the moment, when today’s regime falls apart, and it certainly is going to fall apart at some point, there will be a huge problem. We can’t conduct election immediately in order to immediately elect a new honest, honestly elected power in the country. What today’s regime has done doesn’t allow that to happen after immediate elections. They’ve adopted such laws. They’ve set such people in the electoral commissions that it’s impossible to conduct an honest election. There’ll have to be a transition period during which political reformer will need to take place and these honest elections to be prepared for. We figured it will take about 24 months to get this done. This work is something myself and my team could take upon ourselves or at least participate in getting it done. CHARLIE ROSE: Can you go back to Russia? MIKHAIL KHODORKOVSKY: Under today’s regime, I can return to Russia only in order to immediately go to jail. After this regime leaves, there’s no doubt that I will be able to return and I will return. CHARLIE ROSE: They made it clear to you that if you come back you go back to jail. MIKHAIL KHODORKOVSKY: Well, of course. At first they said this softly, and then a few more times said it even more harshly. CHARLIE ROSE: How did they say it? MIKHAIL KHODORKOVSKY: First, the supreme court of the Russian federation for the first time in history refused to abide by a judgment of the European Court of human rights, that had ruled that my verdict should be reviewed. Subsequently, they opened a new criminal case against me and even requested Interpol — Interpol, obviously, refused them. Today, there are dozens of people in the country who are being searched, being brought in for interrogation. They are being intimidated, specifically because of their association with me and the work that I do. CHARLIE ROSE: Did you believe the Russian regime is a criminal regime? MIKHAIL KHODORKOVSKY: I would say that the technologies that they use, this attempts to buy people who don’t agree with them. If you can’t buy them, then intimidate them. The creation of a hierarchy within themselves through letting everybody give permission to steal on his turf. That really does sound like a criminal model of behavior. And when we work with this regime, we need to understand that this is how they see things. For example, they can’t realize that when a person is trying to make a concession to them, it’s not because he’s afraid of them, but because he’s trying to find a common language with them, a common solution. Any attempt to meet them halfway they view as a weakness and a signal of the fact that you can and should keep on pressing. CHARLIE ROSE: So this is a recommendation you would have for President-elect Trump that he should push forward in terms of negotiating with them, but do it with the expectation that he cannot allow them to believe he is weak. MIKHAIL KHODORKOVSKY: I think that Presidents Trump as a person who spent a large part of his life in business understands such a style that some counterparties in business sometimes have. But there’s another point I want to make here. When we’re working in business, we understand that our agreements with our counterparty are supported by a legal system, which both I and my counterparty adhere to. If we have agreed on something and signed it, we’re going to do it. President-elect Trump in his country in America also understands that he can’t just do whatever he wants because he’s got a congress, he’s got a Supreme Court, the senate, and public opinion that stand against him. Now he’s going to be talking with a person who is completely free from any institutional support and institutional checks and balances. He can sign an agreement with you today, and tomorrow he’ll violate it. And there’s nobody in the country and nothing in the country that will prevent him from doing that. This is a specific feature that needs to be taken into account, and that’s why I say that strategic agreements with Vladimir Putin are hardly likely. CHARLIE ROSE: Even though we have nuclear agreements with him? With Russia. MIKHAIL KHODORKOVSKY: I very much hope that nuclear arms is not a subject that’s going to be put on the table immediately. That’s, after all, something that is best to not even think about. But if we go beyond the bounds of mutual nuclear deterrence, all other agreements need to be based on some kind of common values. There are no such common values. CHARLIE ROSE: And what we call rule of law. MIKHAIL KHODORKOVSKY: Absolutely. And then we get a very serious problem after this. When the president of the United States says something, even though he’s a very influential person in the American political system, he does know that there are some things, some lines he cannot cross. President Putin does not understand that and doesn’t realize this. For example. CHARLIE ROSE: So there is no restraint on his power in Russia? MIKHAIL KHODORKOVSKY: Absolutely so. And he projects this on to his counterparty at the negotiating table. If those say to him, well, I do have constraints, there’s something I can’t do. He thinks they’re trying to deceive him. CHARLIE ROSE: What does he want from the United States? What does he want from the new government of the United States? MIKHAIL KHODORKOVSKY: Putin’s global task if he sees it is to ensure that his regime is not replaced. That’s his global task. But because in his head, the whole world stands against him, and he projects this point of view on to all of Russian society, he needs to be shown an enemy. An enemy will always be such a convenient enemy because it’s powerful, but far away. That is, you can call him an enemy without having to worry about it. And he needs little victories, like he’s got in Syria, for example, or Ukraine. So Putin right now is going to try to get from the new American administration and a consolidation, if you will, of the acknowledgment of his victory, the annexation of Crimea, what’s going on in Eastern Ukraine, what’s going on in Syria. He needs for the new administration to say, all right, Vladimir, this is your victory. You won, you did everything right. We’re going to establish the new world order together with you. I’m not sure if the new administration in the U.S. is ready for such a thing. CHARLIE ROSE: We don’t know yet. I mean, clearly, because the new administration doesn’t even have its team together. But that is one of the questions, an important question that came out of the campaign. What will be the relationship if Donald Trump wins between a President Trump and a President Putin? What kind of relationship, what kind of understandings might they have about the world order? MIKHAIL KHODORKOVSKY: My opinion is that Putin has already worked out that model that he would like to use with Donald Trump. He worked it out on Berlusconi. He’s going to look for some kind of personal understandings, personal relations along the lines of like here we are, you and I way up on top, altogether just the two of us and everybody else is somewhere there below us. I’m not sure whether the American political system could handle this kind of style of relations. CHARLIE ROSE: In Syria, what does he want? Does he want to have his person, Bashar Assad, stay in power so that Russia gets what? MIKHAIL KHODORKOVSKY: Well, as I already explained to you, in my opinion, Putin, his task number one is to keep his regime unchanged, because this is done using methods that aren’t very welcomed in developed democratic countries. He needs to create the various points where things that he can change. That is, if you do this for me, if you allow me to do what I want in Russia’s inner orbit, then I can give you a concession here. So what he wants is first create problems, and then make it so these problems can be resolved only with him. Syria is one of these problems that has been created specifically so that it can then be exchanged for something. That’s his line of behavior. And it hasn’t been unsuccessful I have to say. It’s another matter that as was the case in Ukraine, you need to pay for this with the lives of our soldiers. But human lives are not nearly as valuable to him as they might be to others. CHARLIE ROSE: And he views Syria and Ukraine as a bargaining chip to maintain the stability and the survival of his regime in Moscow. MIKHAIL KHODORKOVSKY: I would say Ukraine might have a value in and of itself on top of that. CHARLIE ROSE: Yeah, as a border. MIKHAIL KHODORKOVSKY: Yeah. It’s the near, it’s a near neighbor and you would like to have a government in Kiev that is answerable to Moscow, yes. But these are indeed just playing cards for him, and nothing more than bargaining chips. CHARLIE ROSE: How weak is the Russian economy? MIKHAIL KHODORKOVSKY: The Russian economy, and I’m very sad to say this, is deteriorating. It is gradually losing its competitiveness. We can see this easily from how modern day products are becoming a smaller and smaller part of the whole manufacturing base. I think that we’re really at the next circle already. Even education is getting worst because for the kind of industry that you’ve got in Russia today you don’t need the kind of education that we used to have. Nobody needs that science. So degeneration is taking place, and this is a process that has gone quite a way already. Does this mean that as a result of these economic problems, the regime will collapse? No. That does not mean that. A deterioration of the economy, in and of itself is not going to drag down the foundations of the regime. CHARLIE ROSE: No matter how low the price of oil is, the regime will be able to withstand sanctions, economic pressure, declining price of oil which is not declining by the way. But you know much more about that than I do. MIKHAIL KHODORKOVSKY: You probably, again, unfortunately had this experience with Iran. MIKHAIL KHODORKOVSKY: When the standard of living deterioration is compensated for by propaganda about enemies outside of Russia are attacking and doing nasty thing to our economy. Putin is using this Iran experience the whole nine yards. CHARLIE ROSE: In term of Europe, what are his objectives in Europe? MIKHAIL KHODORKOVSKY: I think that the main goal, again, is the same one that I mentioned before, but the methods that he wants to achieve this is by destroying a united Europe. For Putin, it’s much more effective and promising to work with individual national governments than with a united Europe that naturally has opportunities in this case to stand for its common values and common interests much better. What he’s doing now is these breaks, he’s provoking these break, these cracks. We know that Putin right now is both ideologically and financially supporting radical movements both left and right. That’s irrelevant to him what these movements are like. What’s important to him is that society in Europe be polarized, and as a result of this for Europe to start breaking apart. Unfortunately, he is also not without successes in this area. There is a general trend of movement away from globalizational processes, but he’s putting himself into it very successfully. CHARLIE ROSE: And you do see people, certain leaders announcing, kind of respect for Putin, announcing a kind of willingness to do business with him so to speak. MIKHAIL KHODORKOVSKY: Yes, yes. Putin is very effective. He has shown that the pressure of political corruption has not been taken off the table at all in European democratic countries, in many of the democratic countries of Europe. In some cases, this is not direct corruption, it’s intermediate, in other cases it’s pressure through propaganda tools, which unfortunately in today’s united Europe have not turned out to be, there’s no alternative to them. But sometime it’s straight ahead corruption, which unfortunately sometimes actually achieves his goals. CHARLIE ROSE: He just fired one of his principals in Moscow for corruption. What was that about? MIKHAIL KHODORKOVSKY: Well, as you know, in Russia there’s a saying that the person who yells, stop thief, the loudest is a thief himself. CHARLIE ROSE: I didn’t know that, but yet the person who says, thief, thief, is more likely to be a thief. MIKHAIL KHODORKOVSKY: So, that’s not the only thing here. In Russia, the corruption agenda does resonate with society, and the opposition obviously tries to raise this agenda, and Putin naturally wants to co-opt it to himself. Plus, now he has to conduct a purge, a cleansing of his circle. And for this purging, the corruption theme gives it a nice noble facade to this clean up. Although, of course, you understand there isn’t a single clean person in Putin’s circle. Some are more corrupt, some are less corrupt, some act more decently, some act less decently, but just about everybody is corrupt. I’m saying that maybe there is some one person hiding some place who is not corrupt. So I don’t want to paint all of that. CHARLIE ROSE: But does that include your fellow oligarchs that we’re familiar with some of their names. Are they by definition corrupted if they are continuing to do business in Russia, and seemingly have a good relationship with Putin? MIKHAIL KHODORKOVSKY: Look, in 2003, we were at a crossroads. We could either have gone to an open economy without corruption or we could have followed and continued the same path. Putin made the decision for the whole country. And let me put it this way. It’s hard for me to imagine how you can work in Russia today without taking direct or indirect participation in the corruption processes. Let me give you one example, it’s actually very visible, the example of — or Ulkiyo, sorry. Ulkiyo received money as they accused him at Rosneft. And now everybody’s convinced of this and there’s a lot of writing about this in Russia. A very large number of people got money, government employees, and people in the uniformed services. Rosneft, large Rosneft shareholder is British petroleum. Could representatives of B.P. not know that in the central office of Rosneft there are systemic bribes being given to members of the government, members of the cabinet, employees of the law enforcement agencies. Well, maybe, they might not have known, but I find that hard to believe. CHARLIE ROSE: Possible, but you would find it incredible. How much money does Putin have? MIKHAIL KHODORKOVSKY: Well, when I used to be asked this question, I always used to answer that I think personally he doesn’t take money because why does he need money personally. MIKHAIL KHODORKOVSKY: Yes. But the latest investigation with the Radugan, if you may recall all these Bahamian offshore companies have shown me that even in 2012, until 2012, there was a direction in which money was being paid by people such as Costin and other people from the inner circle, the Putin’s inner circle. So I can’t imagine that this kind of money box could be paid into for anybody other than Putin. The payments were very interesting, out of hundreds of millions of dollars, all the way down to $600,000, which is really kind of interesting. It seems like this is that mechanism that Putin really doesn’t want to stop or can’t stop anymore. This is how it’s done. You know, in these criminal circles that you need to pay tribute to the boss man on top. Part of what you gain you pay upwards. Whether he needs it or not is another question. How much has accumulated there, I would say probably tens of billions, but I have no idea. CHARLIE ROSE: So I’m going to leave Putin with this one last question. In terms of your advice to the new president of the United States in dealing with him would be what? I’m asking you to repeat that, but your advice to Trump. What kind of relationship should he have with Putin? What kind of deals should he be prepared to make? What warnings would you give him? MIKHAIL KHODORKOVSKY: Probably in his rather lengthy business career, he’s had cases when he’s had to do business with people, whom he didn’t trust one bit. And who for various reasons he knew would be able to not adhere to their obligations. Anybody in big business has to deal with such people nevertheless at times. That’s the experience he’s got to think back on when he’s dealing with President Putin. And understand that one of the talents, I really do think this is a talent of President Putin is the ability to have good relations with people, to get — gain their trust. He was taught this back in the KGB still. And in this sense, I have to say they taught him well. You got to remember that. CHARLIE ROSE: All right. You spent 10 years in prison. You went from way up here to here. I would assume that was not a pleasant experience for you. You and I talked about it. And we talked about what you had to have to be able to exist. What did you learn? If you knew that was what faced you, would you have conducted yourself differently? MIKHAIL KHODORKOVSKY: I would very much want to believe that if even had I known what awaited me, I would still have acted the same. Although, I did not expect that it would be so long and so hard. I’m glad that right now at any rate I don’t need to once again have to make a decision like I did. But if it is necessary, I will make that decision again. CHARLIE ROSE: You would. Because it was who you were? MIKHAIL KHODORKOVSKY: Yes, because that — that’s me. And to be true to yourself is more important than the conditions in which you find yourself. At least that’s how I feel today, and I hope that I would still have enough strength and courage for that if I did need to go through that again. CHARLIE ROSE: There is a — there is an assumption that you have access to millions of dollars. Certainly a lot less than you once had. But that you have access to all the money you need. There’s efforts ongoing, legal efforts to get back money. Where does that stand? MIKHAIL KHODORKOVSKY: The main part of the money that I have disposal to is free money. It’s — I use it for the work that I do in Russia. Part of the money is still today frozen. These freezing took place when I was in jail and right now my lawyers and I, we’re continuing slowly to work at freeing this money. CHARLIE ROSE: This is places like Ireland and elsewhere? MIKHAIL KHODORKOVSKY: Yes, yes. We’re working in an Irish court right now. We’ve filed suit there to release this money and I’m hoping that, well maybe not as fast as I would like it to happen, but I’m hoping that it will be solved. CHARLIE ROSE: But this is money will go to you or go to Yukos, which has been absorbed by Rosneft? MIKHAIL KHODORKOVSKY: Yes. This is just my money. The money that belonged to Yukos are today under the management of Yukos’s management. MIKHAIL KHODORKOVSKY: And I am not, I’m neither a shareholder of Yukos or a member of its current management. So, I have nothing to do with that money at all. This money does exist. I read about it in the press and I’m told about it by my friends that this money that Yukos is money that still remained. This is other money that will be distributed amongst the shareholders. There’s no money that’s been frozen there to my knowledge. CHARLIE ROSE: And Russia issued an international arrest warrant last year, an international arrest warrant last year charging you with the murder of a Siberian mayor in 1998 and the attempted murder of a man who is head of a rival oil company in 1999. MIKHAIL KHODORKOVSKY: You know, this was a rather high profile case in its time and it was investigated in 1999. The people were found who were guilty of this and it was determined who had put out the contract for this murder. In 2003, when the case against Yukos began, all of those decisions were repealed and the witnesses were forced to finger completely other people. So this has been going on since 2003. It’s being used exactly in those moments when there’s a need to put pressure on me or on my colleagues. 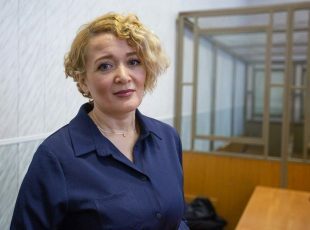 I greatly regret to say that this is not just idle talk but the last Yukos person still in jail is sitting in jail on this case is the head of our security department. He’s in a — he’s got a life sentence. He’s been made an offer several times to finger his bosses to finger the company’s bosses. He has refused to do this, and has remained in life imprisonment. A year ago, when I was already at liberty, I told him publicly I told him that I am, I call on him to give whatever testimony they want from him. That’s just fine. Let him say whatever they want him to say. I am confident that nobody’s going to believe him anyway. If this gives him freedom, let him do that but he’s refused again. And he remains with a life sentence and it’s very difficult for me to talk with his mother, for example. MIKHAIL KHODORKOVSKY: Yes, it’s all very difficult. CHARLIE ROSE: Do you fear for yourself? MIKHAIL KHODORKOVSKY: Of course there are risks. But compared to those risks that existed when I was in jail, when just one finger motion would be enough to make me cease to exist. These are all risks that I am just not paying any attention to at all. I know that until today, Putin does regard me as one of his most acute opponents. He doesn’t have too many of them but I’m certainly seen as one of the most serious of them. The reason is understandable, Putin believes that everything in this world takes place only for money and because I have money, obviously I am the most dangerous. If he gives the command to kill me, it will be difficult for me to survive that. He has many opportunities. But for now, this command doesn’t exist and I’m hoping that we’ll never get to that point. CHARLIE ROSE: Why do you think it doesn’t exist? MIKHAIL KHODORKOVSKY: I would like to believe that my efforts and the efforts of people who think like I do are enough that if such a command does get issued that I would find out about it. CHARLIE ROSE: So somehow you would know somebody who would give you an early warning? You have friends. MIKHAIL KHODORKOVSKY: I want to believe that this is so. I do think that I would know, and this is what allows me to live peacefully now. Maybe I am deluding myself but it’s impossible to live if all you think about every day is, am I going to get murdered today. At some point you needed to set that aside and keep living how you live. To do what you feel is the right thing to do. But if at some point you’re going to have to die, look, hey, we — none of us live forever anyway, right? CHARLIE ROSE: Right. But you are saying you have to in a sense that you are not in any way restraining yourself out of any fear of what may happen to me. You have basically made that decision, that what you will say and do other than going back to Russia, and encouraging democracy, encouraging young politicians, and encouraging the rule of law and encouraging free institutions has become your life’s work. Or not? MIKHAIL KHODORKOVSKY: That’s the point of my life today. That’s — it’s become the point of my life today. And I’m not going to set that aside because this makes my life somewhat more dangerous. OK, so it’s more dangerous. But at the end of the day, if you’re going to live any other way that’s the same thing as dying today anyway. Got to live the way we think is the right way. And then that can be called life. If we live how somebody else is telling us to live, that’s not life, that’s just survival. I don’t want that. I’ve spent 10 years having to live that way and I don’t want to do that anymore. So I’m working away today. CHARLIE ROSE: Was there an alternative, could you have done something, could you have had an impact of a different kind if you had maintained your position and had some other kind of influence? MIKHAIL KHODORKOVSKY: Until the spring of 2014, there actually was an opportunity, a chance that we could find some way to solve problems together with the Kremlin. And even better opportunity existed in 2011 before the president totally in contrast or counter to our Constitution decided to return to office. Now he’s crossed — passed those crossroads already and now I just don’t see any other way other than to help my country the people to prepare for this moment when this regime will fall because it will certainly fall. And the situation in which the country will be at that time is not going to be a very good one. Even today, it’s not in a great situation, but I fear that it will be continuing only. And right now Putin wants by 2018, wants to offer a new model to Russian society. I think that this model is going to look very much like the Chinese model. When you have relative freedom in the economy, and it’s quite big, it will be compensated for by a very tough harsh political system. That’s not going to work in Russia. I guarantee it’s not going to work in Russia. In order to convince yourself that this is not going to work, or in order to convince himself that it’s not going to work, it’s going to take Putin a year — a couple of years. By 2020, he’s going to have to start thinking about leaving. CHARLIE ROSE: Why — why do you think it will not work? There is an authoritarian, within the Russian culture there’s an authoritarian streak. As it was in China. You know, many Russians believe that Yeltsin and others made a mistake they should have fixed the economy and left the politics alone as the Chinese did. Why do you believe it will never work to do it that way? At this late date? MIKHAIL KHODORKOVSKY: Russia is quite a developed country. MIKHAIL KHODORKOVSKY: With social mentality that has developed and this is different mentality from the Chinese one. CHARLIE ROSE: Yes, and a rich cultural history. MIKHAIL KHODORKOVSKY: Our state structure doesn’t have this idea of service that exists to a great deal in China. At the same time, people in Russia have really gotten used to living for themselves. All this talk about how there’s this vertical of power in Russia, this harsh system of managing the country, actually these are lies. There is no vertical of power in Russia. Putin runs only a very small number of people in his inner circle. And he resolves specific concrete tasks, the main task number one of which is to stay in power. The country on the whole actually is run by a whole bunch of people. Not a single group of people but head or a genius people at the regional and federal level. MIKHAIL KHODORKOVSKY: Each of whom has his own piece of turf. You can’t in a situation like this develop a normal economy in Russia if you don’t have an independent judiciary. But the moment you have an independent judiciary, today’s system of governance falls apart. You can’t adopt normal laws in such a huge country if your parliament doesn’t professionally discuss these laws as is done, say, in the U.S. Congress. The moment you have a normal independent influential parliament, today, system of power falls apart. You can’t conduct a modern economy in the country in Russia if you don’t have a small and medium size business. If you don’t have independent entrepreneurial associations the moment this monopolization of the economy that currently is in the country starts falling apart. When 70 percent of the GDP is in Putin’s and in his inner circle’s hands, whether or not it’s state enterprise or not. CHARLIE ROSE: Seventy percent of the GDP is in Putin or in Putin’s circle of friends. MIKHAIL KHODORKOVSKY: Yes. And they don’t need privatization either. They’re perfectly happy with this economy being formally in the government hands but they are personally running it. I’ll give you the example Rosneft itself. MIKHAIL KHODORKOVSKY: Rosneft is a state company, the state owns a substantial part of that company. According to our constitution, the Russian government’s share in companies is not run by the president but by the government. Sechin, the head of Rosneft, formally, officially have said that he is not going to be accountable to the government. But if you call that state enterprise, a state enterprise I have no idea what Sechin’s private property is. MIKHAIL KHODORKOVSKY: And his teams. So, the moment this monopolistic structure falls apart and you need that for an economy to develop. Monopolism is killing development in Russia, you understand that. At that very moment today’s regime falls. In other words, Putin even if he wants to conduct a reform, he can’t. And I’m sure that he will realize this. I know that in the next few years he’s going to realize this. And then no other variant other than either totally collapsing the country or leaving himself, he won’t have any other alternative. CHARLIE ROSE: Do you believe you know him and understand him? CHARLIE ROSE: I’m talking about his mindset. MIKHAIL KHODORKOVSKY: About how he thinks about how to manage people and governance, I think that I, and other people who have been watching him for a long time understand him very well. Because really in the past 10 years or so he hasn’t changed much at all. MIKHAIL KHODORKOVSKY: He’s become a little more self-confident maybe. MIKHAIL KHODORKOVSKY: Of course. I’ve always said that he’s being successful in some of the things he’s doing. Against the background of the — of falling apart of the Russian economy. He’s got lots of success in manipulating the western political system. I’m not quite sure what Russia citizens gain from that. CHARLIE ROSE: Who are the five most important people to him? The five most important people to him who he depends on for his control, success, survival. MIKHAIL KHODORKOVSKY: I’m not really sure that there are people on which he depends directly. But there are people that can manipulate him quite successfully. Inside Russia it’s considered that number one, in manipulating Putin is Igor Sechin, also an extremely important person strange as it may seem for Putin is Ramzan Kadyrov. CHARLIE ROSE: Chechen — Chechen. MIKHAIL KHODORKOVSKY: Yes. A leader of Chechen. CHARLIE ROSE: You believe he will fall. You believe at some point in the future there will be a Russia without Vladimir Putin. MIKHAIL KHODORKOVSKY: I think that such a reason will be Putin’s realization that any model that he can offer Russia is not going to work. He has already offered Russia two models. He’s now going to offer a third one and it too is not going to be successful. And I think that will lead to the psychological crises. How this psychological crises is going to actually be implemented, if you will. Well, my image of the best option would be if Vladimir Putin tries to himself transfer power to his chosen successor. The successor will put together a round table or as they stay in the Constitution a constituent assembly that will form a transition government, conduct a political reform and lead the country out of crises. And then in 24 months, honest elections. That would be the gentlest transformation possible. All the other way of transformations are much less gentle and I don’t even want to articulate them because I don’t want to bring harm to my country. CHARLIE ROSE: For more about this program and early episodes visit us online at pbs.org and charlierose.com. Content and Programming Copyright 2016 Charlie Rose Inc. ALL RIGHTS RESERVED. Copyright 2016 CQ-Roll Call, Inc. All materials herein are protected by United States copyright law and may not be reproduced, distributed, transmitted, displayed, published or broadcast without the prior written permission of CQ-Roll Call. You may not alter or remove any trademark, copyright or other notice from copies of the content.